What to do if you get your powerchair wet? One our of electric wheelchair/powerchair manufacturer’s (Pride Mobility) put together this useful article on what to do if you get your powerchair wet. Particular useful at the moment with the unpredictable weather and April showers so we wanted to share this with you below. If you do have any issues or need some advice please do call us on 0800 046 3949. “In the real world, water is a fact of life. Weather is unpredictable and cannot be controlled. You can be out with your powerchair and suddenly, a rain or snow shower hits! Plus, even after a storm is over, there may be large puddles or piles of snow in the roads or on the pavement . It’s important to understand how water affects electric wheelchairs. By taking action following contact with water, you can preserve the life and performance of your power wheelchair. When faced with sudden inclement weather, there are a few things you can do. Depending on the severity and heaviness of the rain or snow, we recommend finding shelter until the storm passes. Try to avoid large puddles. Your powerchair is equipped with electronics, and direct or prolonged exposure to water or dampness may cause a motorized wheelchair to malfunction electronically and mechanically. Water can cause the electrical components to corrode and the frame of your electric wheelchair to rust. You should periodically examine your motorized wheelchair for signs of corrosion caused by water exposure, bodily fluid exposure, or incontinence. Any damaged components should be replaced or treated immediately, so contact your authorized provider for service. There are some other things you can do to further protect your electric wheelchair. Some consumers carry plastic bags with them. When a sudden shower hits, they cover their controller or joystick with the plastic bag to protect it from the rain or snow. Also, it’s a good idea to check the weather before you leave the house. If the forecast is calling for wet weather, consider changing your plans or staying home. Well done to Marcy Lashbrook who runs our Plymouth mobility store for becoming a Power List 2019 Retail Champion. The ‘Retail Champions’ category commends the work some of the stars of the sector have done over the past 12 months to expand the footprint of their own companies and help their businesses to adapt in an ever-changing market. The mobility retail market is facing unprecedented challenges and it takes someone special and forward-thinking to take a leap and evolve and execute untested ideas. This is particularly difficult when costs are substantial, margins are thin and the stakes are high. But these individuals have truly championed best practice in retail and have been exemplary in their work. Their colleagues will testify that their work has certainly not gone unnoticed. 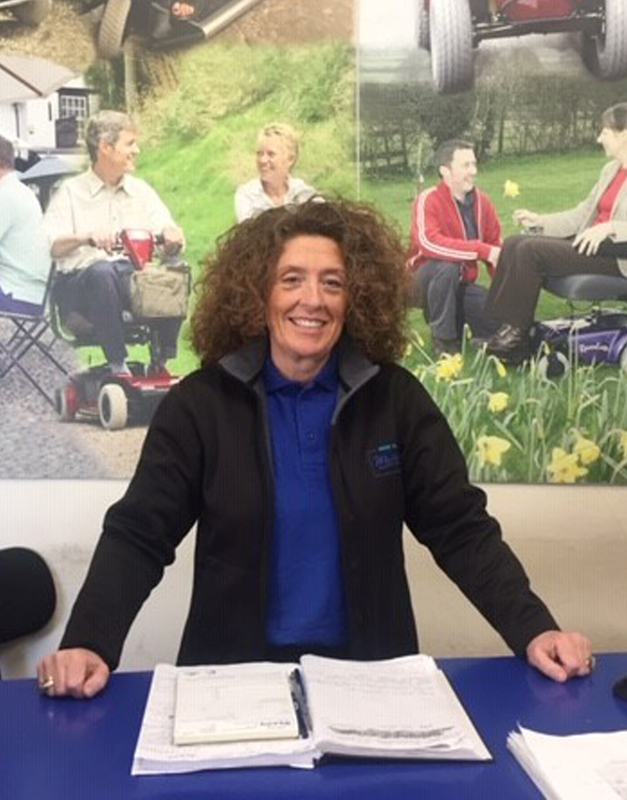 Marcy Lashbrook has run Plymouth’s More Than Mobility store for more than a decade and is considered to be a strong asset not only for residents in Devon and Cornwall, but also the industry itself. She will frequently go out of her way to offer fantastic customer service, working late nights and visiting customers at weekends. Customers often sing Marcy’s praises and many now come into store just to see her. More recently, Marcy has been bucking the trend of many struggling independent mobility dealers by consistently beating monthly store sales targets with ease while managing a team of four staff. Importantly, Marcy has built strong and lasting relationships with key suppliers, which has helped More Than Mobility to weather the tough headwinds independent dealers are currently up against. Last month she made the tough decision to close an underperforming store so the business can focus on its more profitable sites. But it is decision making like this which is essential to overall business success. Marcy’s knowledge, experience and guidance has paid dividends in the last year, which has proved one of the most challenging 12 months independent retailers across the board can remember. Its staff agree that More Than Mobility could not hope for a better figurehead to lead it into the next year. To see the full list of retail champions please click here. Its been a busy few weeks measuring up and installing customers with new stair lifts in their homes in order to keep customers with their independence and access to their whole home. Take back access to all of your home and never struggle with stairs again! Don’t forget we offer a free no obligation quote for both straight and curved stair lifts with quick installation. Call us on 0800 046 3949 to book a quote in your home. New straight stair lifts start from £1,250. Our Northampton mobility store loves to support the local community. Two recent examples are Darren (below) who is volunteering in our store to gain experience for future jobs plus last week a lovely girl from Bishop Storford School joined us for a day for the “Bring Your Child To Work Day”. Unfortunately due to to rising rent and rate costs we have taken the difficult decision to close our Sidmouth mobility store when the current lease expires and we will therefore be closing down as of Friday 29th March 2019. Customers in Devon and Cornwall can continue to visit our Plymouth store and existing customers with any warranty issues will be handled via our Plymouth store. Our Northampton and Plymouth stores as well as the having the ability to buy online continues as before and we welcome all customers. In the meantime please pop into the Sidmouth store and pick up a bargain as we have some items on CLOSING DOWN SALE up to 25% OFF! Welcome to Dee (right) who joined our Northampton mobility store team last month, alongside Debbie our Northampton store manager and Tony our engineer. Do pop into our Northampton mobility store based on the ground floor of the Weston Favell Shopping Centre and introduce yourselves. Please note our customer service telephone lines will be closed on Sunday 23rd December until Sunday 30th December. We will reopen on Monday 31st December 9am as normal. We will also be closed on New Year’s Day on Tuesday 1st January. Customers can continue to order online as normal. Please note that any orders received after noon Friday 21st December will be dispatched on Wednesday 3rd January 2019.